Nearly half of all enterprise IT assets are in urgent need of modernisation. In the UK alone, this represents an estimated technology debt in the tens of billions of pounds, somewhat similar to our national pension deficit. That was the key finding of a senior executive survey of 40 leading financial, industrial, government and IT services organisations conducted by the University of Surrey in early 2016, which showed that 40-50% of IT is effectively out of date. Digital disruption is clearly visible in virtually every sector of the economy, accelerating at a pace not seen in any previous era of technology-induced change. Such disruption is largely associated with the explosion of mobile devices and real-time transactions – underpinned by cloud services – that traditional systems were not designed to accommodate. The advent of 5G mobile, the internet of things, data analytics and machine learning will further widen the performance gap. The survey shows that the challenge of modernising legacy systems is an issue for every sector, with the largest banks and public sector organisations having the biggest technology debt. Much IT investment has taken place at the front end of organisations to support growing customer demand for digital services, but the core systems that form the foundation of any IT estate are unable to evolve quickly enough to respond to the digital tsunami cascading down the supply chain. In particular, the IT sector itself is being rocked by the public cloud phenomenon that is transforming services in a fundamental way. Analysts such as Gartner forecast that 50% of all internal IT and business services will migrate to the public cloud by 2020. Although many core systems have become efficient and stable over the decades of their existence – dating back to the 1970s and 1980s in many cases – they are now seen as a key obstacle in the rapid evolution to a fully integrated digital business. Despite the seismic changes taking place across the digital economy, the Surrey survey reveals that most boardrooms see the process of fundamental systems modernisation as overly complex, too costly and involving unacceptable levels of risk. Only a cataclysmic event such as a full-scale public outage – as experienced by the Royal Bank of Scotland in 2012 – appears to elevate the topic to the board agenda. A quarter of banks will go to financial technology startups for their online and mobile banking requirements by 2020. While CEOs want to become more digital, CIOs will need to convince them that spending more on IT is the way to achieve this. Big banks’ legacy IT systems could kill them – is it too late for the retail bank giants to overhaul their IT and survive? In this context, all evidence suggests that legacy extends well beyond the boundaries of technology itself. According to senior executives, it is more about a prevailing legacy culture, attitude and mindset. Consider new strategic IT partners in place of incumbents who bring innovation and the necessary funding to support complex and lengthy migrations. However, technology should not be seen as the sole answer to the problem. Businesses must aim to simplify business processes and rationalise their product portfolios. There is clear evidence that simpler business models supporting fewer products are not only cheaper to operate, but also more agile. They will be better placed to exploit digital technologies, tools and techniques and make best use of the growing range of cloud services. Ensuring that software design and development adopts an “engineering discipline” to deliver both reliability and flexibility, thus minimising future legacy issues. Overall, the conclusion from the many interviews conducted for the survey is that “do nothing” is no longer an option if leading organisations want to avoid the sort of catastrophic meltdown witnessed in sectors such as retail and entertainment. The report also concluded, more positively, that the growing maturing of cloud services and ever-richer sources of software solutions means legacy systems can be modernised without needing large-scale multi-year programmes to rewrite these applications. It is time for boards and corporate leaders to control their own destinies in the new digital economy – otherwise someone else is surely able to do so. As one insurance executive said, “we don’t want to be Ubered” out of existence. 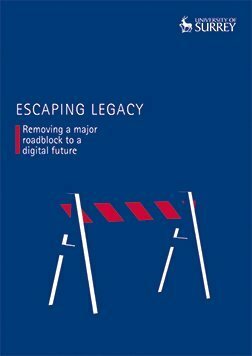 Download the full report by Andy Nelson and Roger Camrass, Escaping legacy – removing a major roadblock to a digital future. Andy Nelson is an experienced IT leader, and former UK government CIO. Roger Camrass is a visiting professor at the Business School, University of Surrey. Many legacy systems are also inaccessible for people with disabilities. Rewriting with modern technologies helps to solve that problem. The difficulty is that new features are constantly being added to many legacy systems. Any project work to replace the legacy system has to also add these features. It becomes difficult to ever get the new system to a place where it has full functionality and can replace the legacy one. I've seen that happen a lot. I suspect legacy IT (and legacy almost everything else) will slowly fall away as systems are improved and staff retrained. No one gave up their buggy whip until they learned how to drive a car. As long as a system is affordable and accessible and understandable, well-trained staff will utilize it.